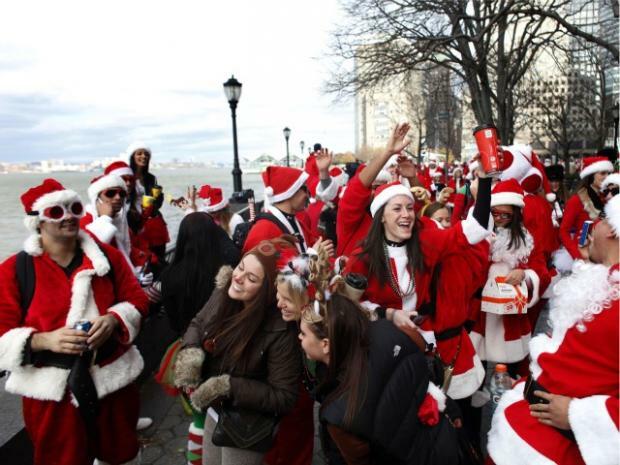 SOUTH STREET SEAPORT — Thousands of drunken Santas terrorized Lower Manhattan when they flooded into the neighborhood for SantaCon earlier this month, openly flouting public drinking and urination laws, locals say. Angry residents attended Community Board 1's Monday night meeting to complain about the latest incarnation of the annual pub crawl, whose participants have been allowed to grow more rowdy every year, they say. "There was public urination, people vomiting all over the place, open containers and no police," said John Fratta, chairman of the Seaport/Civic Center Committee which plans to send an angry missive to Mayor Michael Bloomberg, Police Commissioner Ray Kelly and the 1st Precinct complaining about the lack of enforcement during SantaCon. The committee said that the NYPD devoted more resources to Occupy Wall Street than to SantaCon, and asked police for a better response at the neighborhood's next expected pub-crawl on St. Patrick's Day. "The mayor put so much power on Occupy Wall Street, he had Downtown under lock and key — but he forgot about Santa," said Ann DeFalco, a member of Community Board 1's Seaport/Civic Center Committee, at a meeting Monday night. Residents said they saw unruly Santas buying six-packs of bottled beer on Fulton Street, then standing in the middle of the street drinking them and shattering the empty glass bottles on the ground. The mayor's office referred questions Tuesday morning to the NYPD. The NYPD did not return requests for comment. CB1 staff said they spoke to Santacon organizers, who acknowledged that they had recieved complaints and planned to make changes for next year, a CB1 representative said. SantaCon did not immediately respond to a request for comment. On its website, the group wrote, "Santa does not accept corporate sponsorship or speak to the press." Paul Hovitz, a CB1 member, suggested that people who want to dress up as Santa should do a good deed rather than just drinking. "Instead of going to pubs, they should go to senior centers and do something productive," Hovitz said. "Santa should be associated with milk and cookies, not beer."